Welcome to my blog. It was supposed to be called ‘The Domesticated Geek’ however some nice pregnant lady got it before me. So I used a thesaurus and the closet thing to ‘Domesticated’ it suggested was ‘Housebroken’, the rest as they say is history. Although in a weird twist of fate that term may be more appropriate. What’s the reason for this blog coming to life? That’s my house, a nice little mid-terrace on the outskirts of Sheffield. Took about 9 months of building and decorating works but I am now living there all on my lonesome…and it’s really weird and grown up and I’m not sure what I’m doing with myself. Every day is just a case of me learning how to run a household and do general grown up things, I’m not doing that bad if I do say so myself. However I thought I would scribble down my thoughts and feelings about this new (rather major) lifestyle shift in this here blog. I’m sure it’ll be worth a laugh or two. Also as stated in the title I am a geek, particularly focused on games & film. So as well as discussions on my ongoing domesticated life I’ll also take some time to discuss/analyse/rant about whatever is going on in the world of geekery that takes my fancy. I hope you’ll find that rather interesting too. Well in short that’s my mission statement & that’s my introduction. We should do this again sometime. I’d like to see a regular feature, wherein you give us a photo of a spot in your house on which you’ve MS Painted a character from popular geekdom. Hello there, I’m Phil Mason, a desk drone based in Sheffield by day. However the rest of the time I’m an Improv comedian who plays guitar a bit, acts, writes & performs sketches for the radio. In this blog I mostly talk about my house, the ongoing domestication of myself and the general confusion that goes with it. Also whatever geeky things that take my interest. Sorry if there’s any bad language. Also if my posts are rather sporadic, as I’m a very busy chap. But I will always come back don’t worry. Note: All opinions and rants on this blog are mine & mine alone. So please don’t pilfer them. Thank you. 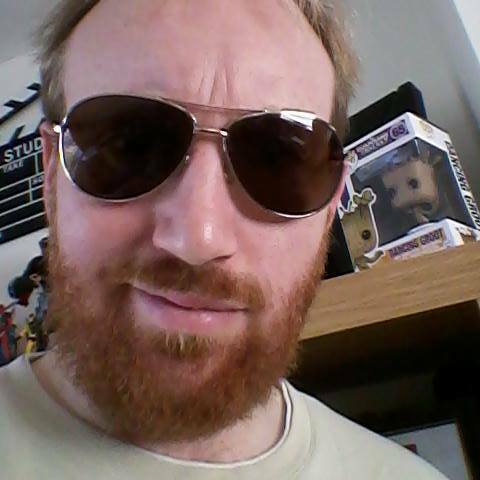 Sheffield based comedian, blogger, podcaster, voice actor, normal actor, general wannabe. The Housebroken Geek Create a free website or blog at WordPress.com.